Prime Minister of the Republic of Srpska Radovan Viskovic presented yesterday the results of the work of his Cabinet after 100 days in office of the 16th Government of the Republic of Srpska. 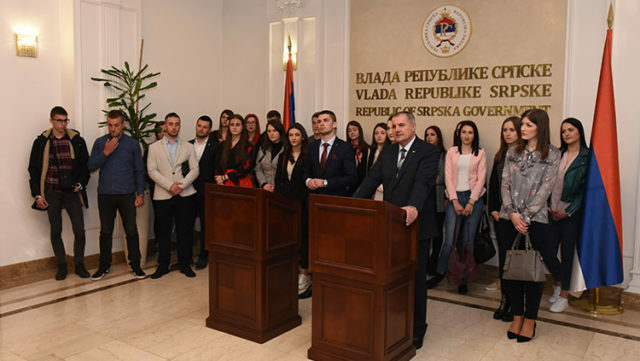 Prime Minister Viskovic said that the Government has been intensively working on implementation of activities and measures included in the Key Note Address and the 2019-2021 Economic Reform Program of Republic of Srpska. “There are seven key measures in the Government’s Program which refer to higher competitiveness and productivity of the economy, sustainable health system, efficient public administration, education and labor market adjusted to the needs of the economy, demographic policy, modern technologies and digital economy and European integrations, international and regional cooperation”, the Prime Minister said and added that activities in accordance with those measures have already been implemented and legal solutions proposed. The Prime Minister said that the Government of Republic of Srpska would continue to implement the planned activities in accordance with the strategic documents that would constribute to progress and development of the Republic of Srpska and reminded that the Government worked on benefits that affect the employers. “Pursuant to the Law on Child Protection it has been enabled that the employers are now paying 80% onto the gross salary, i.e. 50% onto the net salary and as of 1 January 2020 it is the Government obligation that 100% would go at the expense of the Government. Amendments to the Law on Profit have been enacted which shall enable businesses that invest in new production to be eventually exempt from the profit tax. We have further enacted the Law on Games of Chance, the Law on Fiscal Cash Registers, the Law on Efficient Cogeneration and Renewable Energy Sources, etc.”, the Prime Minister said. Prime Minister Viskovic recalled that the Government adopted the 2019 Employment Action Plan and emphasized that during today’s session, the Government adopted the Action Plan for addressing the issues in the health sector. “I have to tell you that this is one of most painful measures and recognized as such in the Key Note Address and the measures of the Government of Republic of Srpska. During today’s session of the Government, the Action Plan was adopted and Minister Seranić will explain it in details in the next few days”, the Prime Minister of Republic of Srpska said and added that the measures have been precisely defined and would be implemented in the next three to four years. “At the moment, the debt of our healthcare institutions and the Health Insurance Fund amounts to a billion BAM and we have to settle that. We have made a precise plan of how we shall go about it. As of January 2020, starting with the new budget year, at least 20 health centers in the Republic of Srpska shall be incorporated into the treasury system. In order to do this, we must clear their obligations by that time”, explained Prime Minister Viskovic. The Prime Minister of the Republic of Srpska announced that he would attend the annual conference of the International Monetary Fund in the United States and that he will hold a series of meetings during that visit. Prime Minister Viskovic said that he conveyed his concern about the situation in the health sector to representatives of the IMF and the World Bank and that they promised they would help if an Action Plan for resolving issues in the health sector was devised and prepared.